It is an oddly satisfying experience to watch as black and white spheres glide through, swirl and reel in white gallery spaces. Join us in the exploration of the story behind them and their maker, a motion graphic designer and visual artist Maxim Zhestkov. Millions of elements create everything we see and touch. Our bodies, our environments, and even our thoughts. Have you ever wondered how these elements interact? The same question occupied imagination of Maxim Zhestkov and led to the creation of this 3D motion graphics video called Elements. 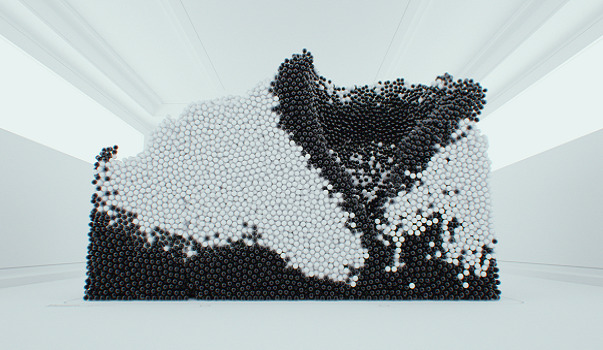 The interaction between the spheres in the video goes from synchronic, almost choreographed, to random, even aggressive, leading to an end where they are all sucked into a blackness of a hole. “The film is a trial to explore the idea that everything around us and inside us is made from simple elements/blocks which can be arranged in complex relationships and become compound structures. Based in Russia, Maxim Zhestkov holds degrees in architecture, graphic design and fine arts. He currently explores the frontiers of art, design, and technology. You can check out his other works on his webpage. Featured image: Still from Elements via zhestkov.com.